I figured out I enjoyed teaching when I created and led group study sessions for upper level science courses in college. 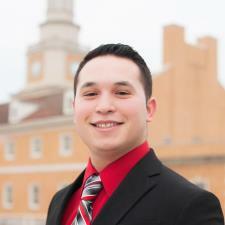 I then served as a formal tutor at UNT, where I received experience in one-on-one tutoring in a variety of subjects. I genuinely enjoy helping students get concepts that were previously difficult to obtain. My tutoring style is that of simplifying concepts and applying them to unique situations to solidify learning before building concepts back up in their complex framework. I graduated from the University of North Texas with a Bachelor's in Biology and a Bachelor's in Psychology, with high honors. I worked in a research lab for 3 years as an undergraduate student which enables me to apply concepts usually only learned in theory during lectures for the sciences. I am currently earning my Master’s in Medical Sciences and also got accepted into medical school, where I will be attending next fall. I also have experience in tutoring the following subjects within UNT’s Office of Health Professions: Biology, Biochemistry, General Chemistry, Organic Chemistry, Psychology, and Sociology. Additionally, I took the MCAT and scored well, for example, in the 90th percentile for the Psyc/Soc section. Rate details: Discounts are available by way of tutoring for multiple hours - message me for details as it is subject dependent. Nearly straight A's in all Biology as a Master's student in addition to my Bachelor's in Biology. My expertise lies more so in the areas of Molecular Biology, Microbiology, Cell Biology, Genetics, Anatomy, and Physiology. I also have experience in tutoring Biology and did well on the MCAT, which contains Biology as a major portion of the examination. Was a tutor at my University through the department of Health Professions for general chemistry, organic chemistry, and biochemistry. I played Trombone for 8 years and recently graduated from UNT. I had the pleasure of playing with some of the best collegiate musicians. I also had the pleasure of learning from world-class music instructors. I earned by Bachelor's in Biology, Bachelor's in Psychology, and double minored in Chemistry and Human Development. I am currently getting my Master's in Medical Sciences. I recently scored very well on the MCAT and will most likely be enrolled in medical school next year. Due to my extensive science background and great test taking skills, I am excited to help students achieve their goals on the Science portion of the ACT. Straight A's in all biochemistry and related coursework as a Master's student (Medical Biochemistry, Metabolism of higher order animals, Molecular Biology, etc). I also have experience in tutoring biochemistry and did well on the MCAT, which contains biochemistry as a major portion of the examination. I worked in a genetics research lab as an RA for 2 years, where I investigated mitochondrial stress using RNA interference and differential sugar diets to my organism of interest. I also did well (straight A's) in undergraduate upper level biology genetics coursework and earned my bachelor's in Biology. I am also currently earning my Master's in Medical Sciences where I am doing well (straight A's) in courses such as molecular cell biology, which overlap with genetics. I tutored undergraduate microbiology at my undergraduate institution. I have taken 23 hours of microbiology or related classes (such as medical bacteriology). I have made straight A's in all 23 hours mentioned above. Initially I took a nutrition science course at my university. I went on to take advanced science coursework that can be applied to nutrition, such as 3 semesters of graduate Biochemistry courses and a series of relevant coursework such as genetics, cell biology, etc in addition to 2 undergraduate organic chemistry lectures with their respective labs. I am currently earning my Master's in Medical Sciences. I earned all A's in my Bachelor's in Psychology. I also have experience in tutoring Psychology and did well on the MCAT, which contains Psychology as a sizable portion of the examination. At least, well enough that I got accepted into medical school. When I took the MCAT I got an embarrassingly low score of a 498. When I retook this beast, I earned a high MCAT score. For example, I earned 90th percentile on the Psychology/Sociology section. Since I know firsthand how to improve from a low to a high score, I can best teach students who need big improvement. I also have experience in tutoring for the MCAT through UNT's Office of Health Professions.